Online registration ends at Friday, March 1st, at 9:00 PM. TIME: Session 1 warm-up-7:00-7:25 A.M. Session 1 will consist of the first 20 entries received (2 heats of 10 lanes)) in the 1650 free and will begin at 7:30 A.M. NO DECK ENTRIES FOR THE 1650! Session 2 will begin at 9:30 A.M. SANCTION: This meet is sanctioned by Michigan Masters Swimming as a sanctioned swim meet. All meet participants must be currently registered with USMS swimming. USMS rules will govern all competition. Pool locker rooms will be available to use for changing. All swimmers should bring their own locks, or plan to bring your clothes and valuables on deck during the competition. 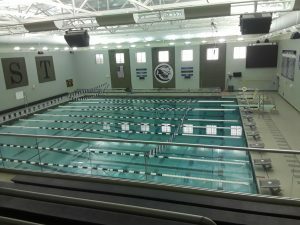 South Lyon Schools assumes no liability for any missing items at the meet. Please include your completed entry blank, check, and a signed USMS Waiver Form. If you wish to enter online, click on the online link on the michiganmasters.com website. ENTRY DEADLINE IS FRIDAY, March 1st BY 9:00 PM. If you are not able to send in your entries ahead of time, there will be Deck Registration from 8:00-9:00 A.M. NO DECK ENTRIES FOR THE 1650 FREE! ENTRY FEE: $30 for entries received in the mail or online by the above deadline. Make all checks payable to: SOUTH LYON MEN’S SWIM AND DIVE BOOSTERS. The fee for Deck Entries will be $35. LUNCHEON: Included with your entry fee will be a post meet luncheon. The meal will be supplied by the South Lyon Varsity Boys swimming and diving parents. Any family members who wish to stay and eat may do so for a $3 charge. ALL PROCEEDS FROM THE MEET WILL GO TO SUPPORT SOUTH LYON BOYS SWIMMING AND DIVING! PLEASE SPREAD THE WORD ABOUT THIS MEET.